Just released over at The Knight’s Lance, Panini’s fantastic blog, was the news that Los Angeles Baseball card collectors have been waiting to hear for a very long time. The upcoming release of 2012 Panini Cooperstown Baseball will include the first on-card autograph of our beloved Los Angeles Dodgers play-by-play announcer, Vin Scully. The voice of the Dodgers, Vin Scully is currently in the broadcast booth for his 63rd season with the organization. With all of the turmoil surrounding the Los Angeles Dodgers over the past few years, the 84 year old Scully has always remained the calm within the tempest, solidly performing his duties. Vin has called some historical games, enhancing the events instead of detracting. He was there for perfect games of Don Larsen’s in the 1956 World Series, as well as Sandy Koufax’s on Spetmeber 9, 1965. Scully has called historical home runs like Hank Aaron’s record breaking 715th homerun off Dodger pitcher Al Downing and Kirk Gibson’s pinch hit home run in the 1988 World Series. He has also voiced iconic moments like Bill Buckner’s fielding error off a Mookie Wilson ground ball that gave the New York Mets the win in game 6 of the 1986 World Series. Scully has been honored by the Baseball Hall of Fame with the Ford Frick Award. The Television Academy has presented him a Lifetime Achievement Emmy Award. He has been inducted into the American Sportscasters Association (ASA) and the National Sportscaster and Sportswriters Association (NSSA) Hall of Fame. He even has a star on the Hollywood Walk of Fame. As I wrote about almost a year ago, the only thing lacking from Vin Scully’s long list of achievements and accolades was a prominent appearance on cardboard. There are only 9 Vin Scully cards, most of them obscure local releases. The total actual number of prior autograph cards have been 4, numbered to 3 in 2009 and a 1/1 this year. 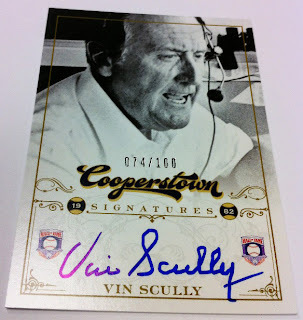 All four cards have been cut autos, nothing directly signed for any card release or sanctioned by Vin. It was way overdue for Vin Scully to have his own, individual, nationally released baseball card. Panini has come through big time with these beautiful on-card autographs that are limited to 100. I’ll be looking to pull one when Cooperstown Baseball hits shelves. That's awesome. But, couldn't we get him on a licensed set? The man deserves better.